A decade ago, on a clear September morning, life, as Americans knew it, would change forever. The horror and shock from the unprecedented direct hit was only a small foreshadowing of the larger repercussions to follow. For better or for worse, a new America was born. On September 11, 2001, terror rocked our complacent world. Still, a new strength fueled by pride and fury emerged almost instantaneously. That strength still courses through our veins today. America will never forget. Newsmax Magazine's "9/11 Ten Years Later"
Our September 2011 Newsmax magazine features a special, 38-page section: "9/11 — Ten Years Later" marking the tragic occasion, and boldly displays on its cover a stark collection of evocative photos telling the haunting tale of the people and places of that fateful day. This special edition includes a wide-ranging, in-depth look at the events that profoundly changed the country and affected the lives of Americans forever. The full-color, glossy issue includes exclusive interviews with former New York Mayor Rudy Giuliani and former New York Police Commissioner Bernard Kerik. Citizens and leaders alike offer you a vivid portrait of a turbulent timeline from the awful day of September 11 and the nation's response, to how we should prepare for new threats on the horizon. 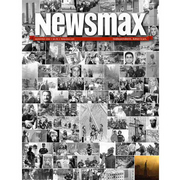 '9/11 Issue' Newsmax Magazine September 2011 A decade ago, on a clear September morning, life, as Americans knew it, would change forever.